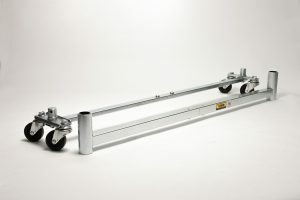 Upgrade your Standard Fixed width AllDolly to an Expandable width AllDolly by purchasing this refurbished Expandable Base and Sliding Beams kit, fully assembled and ready to replace your old fixed width assemblies. The old parts can be returned if desired. This package eliminates the need to modify your existing parts normally accomplished with our ADX-KIT or by purchasing a whole new AllDolly with the Expandable kit built in (ADX series).